I’m still going through some of the shots from our photowalk in Tempe a few weekends ago. There was such a variety of shots stored on my SD card that it’s been hard to pick an choose which ones to work on. Tonight’s post is from Mill Avenue in downtown Tempe. This area of Tempe is the main hangout for students from Arizona State University which is just a few blocks away, so nighttime is when all the action takes place. However, we were there in the early morning hours, so it was fairly quiet and family-friendly, and we got some mostly unobstructed shots of the real estate along the avenue. I found this property available for rent–right between an Irish pub and and Irish restaurant…now, that’s what I call prime real estate! This is an HDR from three bracketed photos, processed in Photomatix v4. I then used Topaz Adjust’s “Spicify” preset (which I normally avoid like the plague but it seemed to work here), and then Topaz DeNoise (just a little bit, really). I used Paintshop Photo Pro X3’s Curves tool to set the white and black points, and to sharpen it slightly. That’s it. 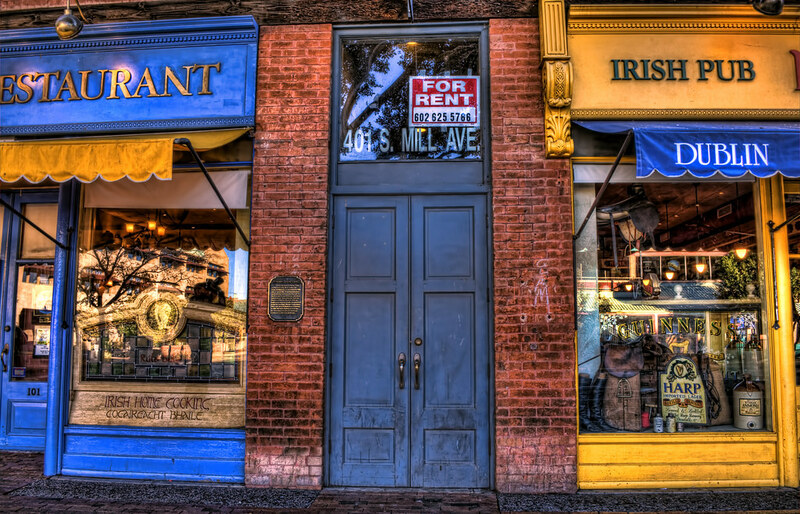 This entry was posted in Information, Processing and tagged architecture, Arizona, AZ, building, camera, D5000, HDR, Irish, Nikon, Paint Shop Pro, photography, Photomatix, pub, rental, restaurant, software, Tempe, Topaz. Bookmark the permalink. Nice, richly saturated image, Zann, and not overdone.